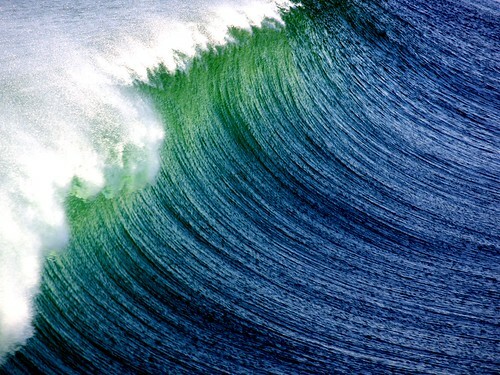 The CSIRO recently released a report on the potential for wave power in Australia. Australia's southern coastline has been identified by the World Energy Council as one of the world's best sites for generating wave power. The report (pdf) shows that if 10 per cent of the energy available from waves was harnessed it would meet half of the nation's current electricity consumption. "Averaged over the whole year, Australia's southern coastline has a sustained wave energy resource of 146 gigawatts (1,329 terawatt-hours/year)" - three times Australia's total installed generation capacity. The author of the study, Dr Mark Hemer, notes wave power is still a decade or two away from being a real force as an alternative energy. "Wave energy really is a baby at the moment - there's currently only about four megawatts of wave energy generating capacity installed globally. If you compare that to wind energy, there's about 200,000 megawatts of installed capacity, or 50,000 times more, so wave energy is a long way behind on the cost learning curve." Australia's longest running pilot wave power program has been run by Oceanlinx in Wollongong for number of years, but the latest incarnation recently suffered a setback when it was damaged by a storm. Oceanlinx are also looking to participate in the UK's "wave hub" program in Cornwall. The other company aggressively pursing wave power opportunities in Australia is Perth based Carnegie Wave Energy, which has a plant operating in WA and is looking to build another in Eden, NSW. The other major source of ocean energy available to Australia is tidal power. One major backer of tidal power in northern Australia was Wilson Tuckey (who lost his seat in the recent federal election. While Tuckey's dreams of tidal power in the Kimberly region remain unrealised, NT News has a report on a tidal power project proposed nearby in the northern territory by Tenax Energy in the Clarence Strait. 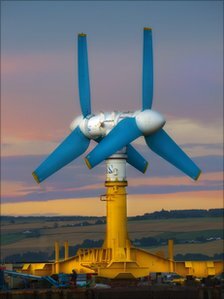 Another Australian tidal power hopeful, Atlantis Resources, seems to have shifted offshore entirely, recently unveiling the world's largest tidal turbine for testing in Scotland.